Every time I walk past a mirror, I lift up my shirt and obsessively stare at these lines that just showed up on my belly last weekend. Lines that look suspiciously like stretch marks. I make it THIS far with no stretch marks, and NOW they show up? Please tell me there’s a drug or a procedure or a surgery that will get rid of those. It’s supposed to encourage your body to go into labor, and my body needs all the encouragement it can get. I’ve been having these 20-second panic attacks where the thought crosses my mind that she’s staying in there FOREVER. No, I don’t mean gear up on baby must haves. For this: When I wake up in the middle of the night because one hand is dead asleep and one hip has a shooting pain down to my foot, it’s time to roll over. But I have to psych myself up for it. First I lay in bed and wonder whether it really hurts enough to roll over. It does. Then I shake out my dead hand and stretch out my bottom leg. Side note: Stretching out the leg you are lying on top of isn’t very effective. Still hurts. Time to turn over. That’s okay, though, because I’ve perfected the process. You just have to break down the rollover of your 35-pound bump into increments of one-sixteenths. With lots of huffing and grunting and grimacing. Don’t skip those because they definitely help get the job done. Or at the very least, they wake up your partner and garner some extra sympathy. 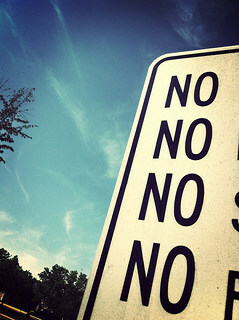 Make peace with saying no a lot. The folks asking are almost as excited for that kid to be born as you are – they’re the ones who have to see your cankles, watch you waddle, and catch you staring at your bare belly in the bathroom mirror at work. If you can’t appreciate their excitement and you fear that you may turn cranky the 731st time you get the question today, it may be better to just stay home. For more tips on getting ready for baby’s arrival, follow my Pinterest board Bundle of Joy. Got a suggestion for how to get this kid out of there? 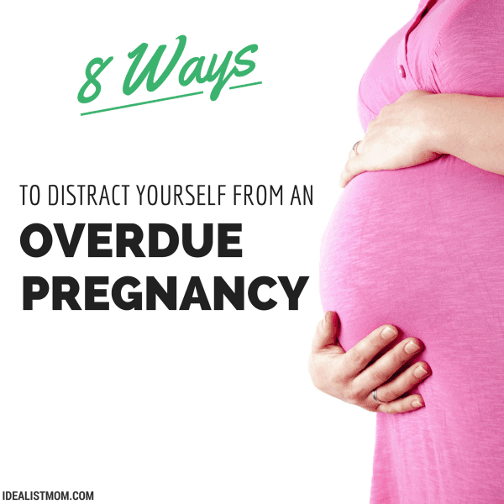 Or the perfect distraction for being past your due date? Share your tips in a comment below. I’m right there with you, I thought this kid was coming for sure last week, although I am just coming up on 40 weeks. In addition to the pineapple, I’ve been loading up on eggplant parmesan. And more chocolate never hurts. I’ve also been enjoying dips in Barton Springs; the cold and weightlessness are great for the swelling and heavy belly. Hang in there, momma! I’m glad we both ended up not going *too* far past our due dates!